"The series is an avant-garde, post-apocalyptic visual feast that has too many eye-popping cues to fully highlight", according to the Trendhunter magazine. 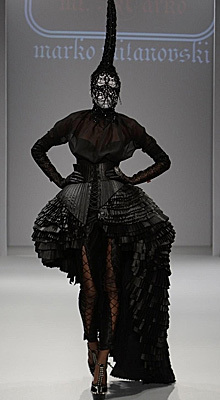 The models were wearing horns, lace-up leggings, Victorian and steampunk-esque waist cinchers and bustles, braided masks, and cage corsets to create a really unique vision. 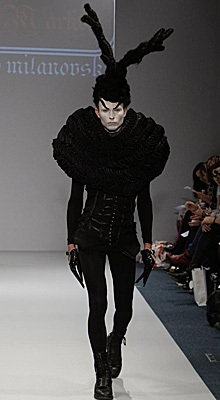 The fabulous Marko Mitanovski gloves, shown on the catwalk, are a stylish accessory, chosen by Lady Gaga to wear on the cover of Q Magazine.